Almond Milk: What Is It and Is It Good for You? Almond milk has been a popular milk substitute since the Middle Ages. It is made by mixing finely ground almonds with water and is low in calories and fat. Almond milk contains ground almonds and water. It's a healthy alternative to cow's milk, and contains more vitamins and minerals than soy and rice milks. Many people who've tried almond milk prefer the flavor of almond milk to that of soy and rice milk. Soy milk contains a lot of protein, but doesn't contain the high levels of vitamins and minerals found in almond milk, so it's often fortified with calcium and vitamin D to bring is nutritional quality more on a level with fortified cow's milk. Rice milk doesn't contain much nutrition at all, so it's usually also fortified with vitamin D, calcium and other nutrients. Both rice and soy milk are good milk alternatives for those who have milk allergies or are lactose intolerant, but you should buy manufactured rice and soy milk to insure that they're properly fortified with the vitamins and minerals you need. 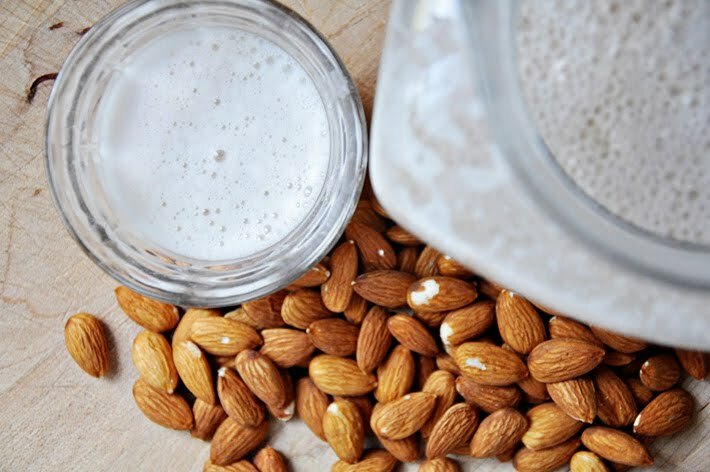 Because almonds are naturally very nutritious, almond milk doesn't need to be fortified. You can make almond milk yourself at home, and it will have the same nutritional value as the almond milk available commercially. Most people have no idea that Almond milk is more beneficial and nutritious than ordinary dairy milk, due to the fact that it contains much more nutrients and it has not been subjected to the same processing. It is also an ideal alternative for those who are lactose intolerant or have allergies to soy. Almond milk, like soy milk, is a perfect alternative to cow’s milk and has a surprisingly rich & creamy taste. The benefits of almond milk are vast, especially for those looking to lose weight. It has a low caloric value, with an 8 oz serving of Plain (which has no added sugar) only containing around 60 calories, which has a much lower impact on your daily calorie intake than skim milk. It is rich in vitamins, and also boasts an impressive dose of bone-building calcium. Almond milk is great for those who are lactose intolerant, because it doesn't contain any lactose. Almond milk also contains no soy, so it's good for those who suffer from soy allergies. Because almond milk doesn't contain casein, a milk protein that's chemically similar to gluten, almond milk is appropriate for those who suffer from gluten allergies. Almond milk is one of the most nutritious milk substitutes available. It doesn't contain saturated fats or cholesterol, but it does contain omega-3 fatty acids, so it's very good for your heart. Almond milk is high in protein; the typical eight ounce serving of almond milk contains about one gram of protein. One serving of almond milk also contains about one gram of dietary fiber. Almond milk is very low in calories; it contains only about 40 calories per serving, and it's low in carbs at only two grams per serving. Almond milk contains about three grams of fat per eight ounce serving, making its fat content equivalent to that of rice milk. Almonds are rich in vitamins and minerals, so almond milk doesn't need to be fortified. Almonds contain vitamin E, manganese, selenium, magnesium, potassium, zinc, iron, fiber, phosphorous and calcium. The flavonoids in almond milk help prevent cancer and slow the signs of aging. The high levels of antioxidant vitamin E found in almond milk make it very effective in the prevention of cancer. Because almond milk is low in fat and calories, and high in many essential vitamins and minerals, it is a great milk substitute for those who would like to lose weight. Plain almond milk without added sugars or flavoring contains 60 calories per each 8 oz serving size. This option works well for people looking to lose or maintain weight. The low caloric content of almond milk causes less of an impact on our totally daily consumption of food calories. Some milk varieties contain more sugars than the cereal that they get combined with. Almond milk contains no cholesterol and only 5 mg of sodium per serving. Consuming foods low in sodium and cholesterol help us to maintain better heart health and normal blood pressure. Without cholesterol, almond milk also decreases our chances of gaining bad cholesterol levels, all while increasing the good cholesterol levels. Almond milk also contains 150 mg of potassium in every serving. This mineral works to promote healthy blood pressure. Unlike other milk alternatives, the plain almond option contains only 8 grams of carbohydrates per serving. The 7 grams of sugars that make up the carbohydrate content have a limited affect on our blood sugar levels. When we consume simple sugars, our metabolic functions tend to miss the nutrients, storing much of the carbs as fat. Instead, the low amount of sugars in almond milk have a low glycemic nature, meaning our bodies fully digest them and use them as energy. Diabetics benefit from this characteristic as well. Almond milk contains 30% of our recommended daily value of calcium and 25% of Vitamin D. These nutrients work together to build strong bones in men, women, children and infants. Vitamin D also helps improve immunity and cell function. Some studies have shown that Vitamin D helps decrease osteoporosis and even Alzheimer’s disease. The magnesium in found in almond milk helps absorb more of the calcium provided by the nutritious beverage. Every serving of pure almond milk contains 50% of our recommended daily value of Vitamin E. This powerful nutrient has antioxidant abilities in that it helps regulate Vitamin A use and availability. More importantly, Vitamin E acts the primary regulatory nutrient that improves skin health. Even though almond milk only contains 1 gram of protein per serving, it does contain B Vitamins in the form of riboflavin, plus other muscle regulating nutrients like iron. Each serving of almond milk contains about 4% of our recommended daily intake of iron, which helps muscles absorb and use protein for energy, growth and repair. Iron also regulates certain cell functions like oxygen absorption. Plain, original almond milk provides 60 to 70 calories per cup, about 15 calories less than the same amount of skim milk. It is low in protein, providing only 1 to 2 g per cup, 2.5 g fat, and has 0 g saturated fat and 8 g carbohydrates. Because of its low calorie content, almond milk may be a beneficial addition to a diet geared toward weight loss or weight management. Almond milk is lower in both potassium and phosphorus than regular or soy milk. Individuals with kidney disease, chronic or acute, must restrict their intake of these minerals, according to the Medical College of Wisconsin. Thus, almond milk may be a better choice. It is a nutritious option for those suffering from lactose intolerance. In addition, soy products may not be appropriate for all individuals; for example, women with a history of breast cancer may be advised by their physicians to avoid soy. Like conventional dairy products, almond milk is nutrient-fortified, and a good source of several important fat-soluble vitamins. One cup of plain almond milk meets 10 percent of the Recommended Daily Value (DV) for vitamin A, 25 percent for vitamin D and 50 for vitamin E, making it high in many nutrients compared to the amount of calories it provides per serving. Vitamins A and E act as antioxidants, enhancing immunity and protecting the body's cells and tissues from damage. In addition, vitamin A is important for healthy eyesight and supports normal growth and development. Vitamin D helps build and maintain strong bones and teeth, and enhances immunity. Almond milk is rich in calcium, providing the same amount per cup as cow's milk and soy milk. One cup offers approximately 300 mg, meeting 30 percent of the DV for this major mineral. Calcium plays many roles in the human body. Along with vitamin D, phosphorus and magnesium, calcium is needed to build and maintain strong bones and teeth. It also helps regulate blood pressure and is necessary for muscle contraction. Those who cannot tolerate dairy products, or do not use them, often come up short on this important nutrient; consuming almond milk regularly ensures adequate calcium intake. Almond milk is a beneficial addition to a diet geared toward weight loss or weight management. Almond milk is also high in fiber. A glass of almond milk contains nearly one gram of fiber per 8oz. serving, and fiber is important for healthy digestion. These totals make it exceptionally high in nutrients compared to the amount of calories it provides per serving. Vitamins A and E act as antioxidants, enhancing immunity and protecting the body’s cells and tissues from damage. In addition, vitamin A and is important for healthy eyesight, improves the skin and supports normal growth and development. Vitamin D helps build and maintain strong bones and teeth, and enhances immunity. Almond milk is lower in both potassium and phosphorus than regular milk or soy milk. Individuals with chronic or acute kidney disease, must restrict their intake of these minerals according to the Medical College of Wisconsin, making almond milk a better choice. It is also a good source of omega fatty acids, which are most commonly associated with fish. Almond milk is rich in calcium, with one cup offering approximately 300 mg, meeting 30 percent of the DV for this major mineral. Calcium plays a big role in building and maintaining strong bones and teeth. Almond milk contains 25% of your daily recommended Vitamin D intake and 30% of calcium both of which aid in building and maintaining strong healthy bones. Having strong bones is paramount in fighting off the risk of osteoporosis in later life.Calcium is also needed to help regulate blood pressure and is necessary for muscle contraction. Those who cannot tolerate dairy products, or do not use them, often come up short on this important nutrient. Almond milk is wonderful for those who are diabetic or who are looking for a milk that is blood sugar friendly, as a typical serving only contains 8 grams of carbohydrates, 7 grams of which are sugar. These sugars make up the carbohydrate content that has minimal impact on our bodies, in comparison to that of normal dairy milk, which contains simple sugars our bodies store as fat causing our bodies to miss out on these vital nutrients. Also, almond milk has such as low amount of simple sugars, giving it a low glycemic nature, which means it is digested fully by the body and used for energy. Opting for the almond milk can also promote a healthy heart, as there are only 5 mgs of sodium and no cholesterol in a typical serving. The low amount of sodium, lack of cholesterol and presence of around 150mg of Potassium within the milk helps keep blood pressure levels normal and aids in maintaining a healthy heart. Almond milk is packed with Vitamin D which is known to improve cell function and immunity, and this has also been proven that it can help decrease the risk of Alzheimer’s. Almond milk helps increase muscle power, which is perfect for body builders looking for a natural way to increase muscle strength and give them the explosive power that ‘unnatural’ products give. It helps improve muscles due to the presence of riboflavin which is a form of Vitamin B and iron. In a typical serving of almond milk benefits is 4% of your recommended daily intake of iron, which helps regulate oxygen absorption. And a high dose of riboflavin appears to be useful in the prevention of migraine headaches. Dairy milk has to be refrigerated or it will spoil, but you will see in the stores that almond milk is set on the shelf with dry foods. It doesn’t have to be set on ice to keep it’s integrity. This fact is excellent for road and camping trips. Use almond milk instead of regular milk and lessen the load in your ice chest. Soy milk isn’t that good for a diet because it is full of sugar. Therefore, the lift people feel after drinking it largely has to do with it’s sugar content. Soy milk also provides about 100 calories per every one cup, where as almond milk has about 40 calories less. Soy milk has 4 grams of fats compared to the 2.5 grams in the almond alternative. Almond milk is a no-nonsense nutritional powerhouse. Use it in recipes as part of your daily diet or with your morning cereal or coffee and you may notice a positive change in your health and mood. 2. Drain soaked almonds, and blend with 4 cups of fresh water until you get a milk-like consistency. Blend with dates (that have been soaked for at least an hour) if you like a hint of sweetness to your milk. 3. Strain once to remove almond granules. The result is a delicious, creamy milk that's free of added oils, concentrated sugars, and synthetic nutrients. This all-natural almond milk keeps for four to five days in an air-tight jar in the refrigerator.